Alabama took a top 3 team to the wire on the road, but ultimately fell to 11-6 on the season, 2-3 in conference play, in a game that came down to the final shot. The starting lineup of Kira, Herb, Dazon, T-Mack, and Donta came out flat. We repeatedly turned the ball over and looked completely helpless on defense as UT jumped out to a quick 16-4 lead. They were out hustling us for every loose ball, which was epitomized by one possession when they got 4 shots at the goal, eventually scoring on an alley-oop dunk. I thought to myself, "well, we accepted defeat before we even arrived, and we're going to get killed like everyone else who's come here this year." Then, John Petty entered the game. He played one of the best games I've ever seen from an individual Alabama player. His road struggles have been well documented here, and for him to score 30 points in that environment against a top 3 team is remarkable. He wasn't just relying on the 3 either. He got to the rim and finished some layups early that really established the game for him. For the rest of the first half we pretty much matched them offensively, but we struggled to get stops. We couldn't stop their penetration and they got to the rim at will. I was adamant that we should try a zone, and we finally did for a couple of possessions, but the results were disastrous. We had guys caught out of position and they ended up with easy layups or dunks. Nevertheless, we did enough on offense to get into the half with a semi-respectable 44-32 deficit. We came out blazing in the second half. Frankly, I think UT took their foot off the gas a bit. We made some minor adjustments on defense, disguising a very soft man as a 2-3 and they were a bit impatient settling for early jump shots, which we did a good job of closing out on. We also started matching their intensity in going after loose balls and limiting them to one shot. Riley, JP, and Donta all did a lot of work on the glass, tipping loose balls to their teammates, that won't really show up on the stat sheet. After a 13-0 run, we had the lead! There was a part of me that thought, "well, that was fun, but they will probably put it together and blow us out now." Nope. They did make an adjustment and started fronting JP to deny him the ball, but they continued to struggle with our "soft man" defense. The game went back and forth for most of the second half. They built a 6 point lead but we were able to get JP free for a couple more 3s to get back in it. We had a 5 point lead at one point but missed free throws and took some bad shots from the perimeter when we had a chance to extend it. Grant Williams made a great play with a minute and a half remaining to close out and block a JP jump shot from the corner. JP said in the post game that he should have pump faked, but he made that exact same shot earlier in the game, and Donta was in good position under the goal to get the rebound, so I was okay with the shot. Hats off to Williams for making a great play. Down the stretch UT had the ball with a one point lead but Donta drew a charge on Grant Williams to foul him out and give us a chance to win with 13 seconds left. The UT fans were beyond upset with the call, and I agree that there was a bit of acting on Donta's part, but ultimately Williams did lower his shoulder and create the contact which gave him an advantage. It was the right call. So we had the ball with 13 seconds and a chance to actually pull the upset. We got the ball to JP who created space but was called for a travel. From my vantage point, it was so loud in the arena we couldn't hear the ref's whistle, and we were blocked from seeing his initial signal, so we didn't know what he called, but from the reaction of the crowd and CAJ we knew it went against us. They showed the replay on the scoreboard, but the ref wasn't in the shot so we still didn't know what was called. The UT fans around us theorized he was called for hooking, and admitted even that was was a ticky-tack call at that point in the game. It wasn't until my Dad called me after the game and told me that even the announcers said it wasn't a travel that I knew that they called a walk. 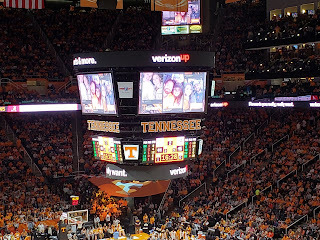 I certainly didn't see it in real time, and even the UT fans around us didn't notice it when they showed the replay, but, when I returned home and watched the replay on a clear screen in slow motion, I agree he did travel. I know that won't be popular here, but he shuffled his feet before he dribbled. It was a bit of a late call, but it was the right call. 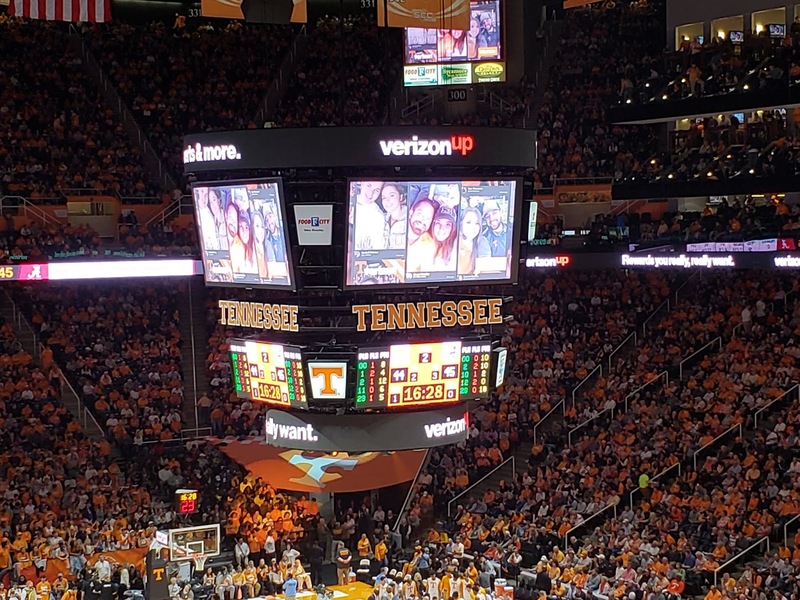 That being said, it's also a call that probably isn't made if we're playing this game anywhere other than Thompson-Boling arena. I also feel really confident that JP would have made the game winning shot, and even if he missed it, Donta was in great position for the put back. We win if that travel isn't called, and rightfully or not, that travel isn't called 90% of the time. While everyone is understandably upset about that call, it's not the reason we lost. We lost this game because we shot a laughable 44% from the free throw line. If we shoot just 60% we have at least an 8 point lead in the second half and it doesn't even come down to a single possession at the end. We knew going into this game it would take a nearly perfect effort and a UT off day for us to have a chance. 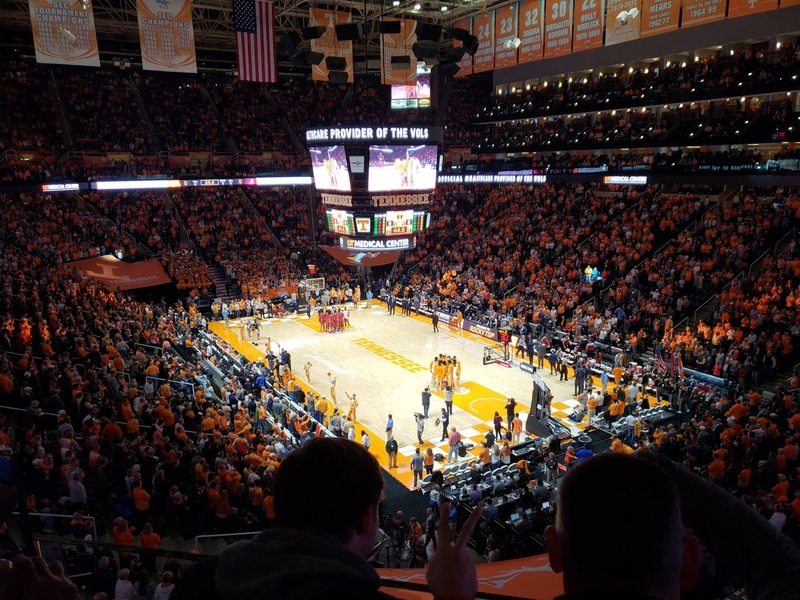 The Vols obliged, and we played nearly as good as we could, but you don't upset a national championship contender on the road by missing over half of your free throws. We played very good, but not perfect. JP ended up with 30 points and was the main reason we were able to stay in the game. I don't expect this every game, but if he can give us anything like this consistently going forward, we are a much better team. The fact he did this in arguably the most difficult road environment we'll face this year is very encouraging. Donta had another double-double with 16 points and 12 rebounds. Kira scored 12 points in 33 minutes. T-Mack struggled in the first 7 minutes of the game and didn't play after being replaced by JP. Herb was terrible. He picked up 3 fouls, only scored one basket and missed both of his free throws. He's great defensively, but he's fouling more than usual on that end and is a complete liability on offense. He missed a couple of 3s badly, one of which was at a key point when we had momentum and could have taken a 3 possession lead. We played 10 guys in the horrendous first 10 minutes of this game, and only played 8 in the second half with Kira and JP playing the entire second half. Note to Coach, take a lesson from this, less is more in the playing rotation. My only other complaint with our coaching in this game was the use of timeouts. We used two when we had momentum and the ball and a media timeout coming up. The one with a little over 8 minutes left was most egregious, and it would have been nice to have that at the end to draw up something other than a 65 foot heave to force overtime. It was a sellout and there were very few empty seats with over 21,000 in attendance. There were much fewer Alabama fans there than in some of my other recent trips there. We were the only ones within at least 3 sections of us, and I would guess we had no more than 100, most of which were in an upper corner across from us. The atmosphere was great. The Vol fans were loud at appropriate times, but they did seem to turn on their team a bit when we had the lead in the second half. That said, it's obvious they are still a wannabe football school given their over the top reactions to announcements for Jeremy Pruitt and Tee Martin. With the exception of a few obnoxious jerks behind us running their mouth about the Clemson football team (they've been reduced to taking great pride in sharing the same color as the one team that can actually compete with us in that sport) for the most part their fans were very nice, welcoming, and complimentary of our team. The group in front of us was awesome, they were knowledgeable and passionately cheering for their team but at the same time cordial and understanding of us doing the same. Personally, I hate Tennessee with a passion. I hate them more than auburn. I was in school when Fat Phil was trying to put our football team "out of business." That orange is ugly as hell, and rockytop is undoubtedly in the top 5 of most obnoxious songs ever written. Nevertheless, what Rick Barnes has done with that team is amazing. They all seem like great guys and they play very well together, and as I said, for the most part their fans actually aren't that bad. If their uniforms didn't say "Tennessee" I would actually like their team a lot. Up next, the Ole Miss Black Bears/Rebels/Admiral Ackbars/Landsharks/whatever they decide they want to be this week will come to Tuscaloosa for an 8pm tipoff Tuesday night. If you don't have tickets yet, they are offering a buy one get one free promotion (which is embarrassing in and of itself but I'll save that rant for another day). Ole Miss is a top 25 team and it will be interesting to see how the team responds to this loss as we really need to get back in the win column at home. The game will be televised on ESPNU.